Introducing the talented sound and music composers of Jinx: Womb of Cosmos! From the development team of Jinx: Womb of Cosmos, there are two exceptional and very talented individuals that handle the game’s sound and music: Asimakis Reppas, and Thanos Zampoukas, and in this blog post they will be answering a few questions about their work, their influences and their involvement in our upcoming fantasy RPG. We are planning to include a deep and epic soundtrack that, combined with the Gothic atmosphere of the game, will set the mood of the player in every given situation and will create a dark and addictive atmosphere. But let’s not waist much time and let’s hear what the guys have to say! Let’s start with the usual; tell us a few things about yourselves. A.R. 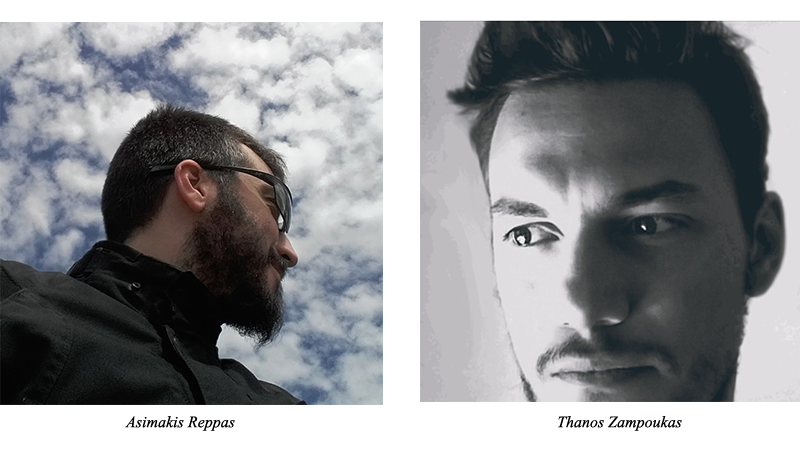 : I am a sound designer, music composer and game designer, with a degree in Audio Engineering from SAE Athens and a BSc in Digital Systems from the University of Piraeus, and currently working towards a Master’s Degree Thesis for the European University of Cyprus, which, of course, includes an educational video game. I’ve utilized this knowledge in various music, video, gaming and even theatrical projects, and hold distinctions for audio and design in numerous Game Jams, as well as a few years of experience in the position of Audio Lead for “Darkfall: Unholy Wars”. Other than that, I enjoy a lot of time in front of a computer, or playing football, or reading about software architecture and user-centered design. T.Z. : My love from music started from a very young age, and although my parents and my social circle may have played an important role in this, it became blatantly evident during elementary school; I wanted to reproduce music on my own, and I focused a lot on lessons on music pre-theory and flute. I went on to more advanced theory during high school, and started learning the guitar as well, and as I progressed in my studies, I realized I really wanted to compose my own music. Taking that decision to heart, I took a degree on Harmony, Counterpoint and Fugue, which I finished successfully in tandem with studies in the Faculty of Music in the National and Kapodistrian University of Athens, with a Bachelor of Arts (BA) in the fields of Historical and Systematic Musicology, Sound Technology and Music Education, as well as Ethnomusicology, Cultural Anthropology and Byzantine Musicology. I am currently pursuing a postgraduate degree in Composition and Orchestration. How did you get involved with Jinxsoft? A.R. : I had, in fact, heard about Jinx before I was approached. As an old-school role playing gamer, the concept of the game had intrigued me ever since I first heard about it. Of course, after getting approached, I kept my excitement tempered with caution, because a lot of grand plans come crashing down in this industry. Those doubts dissipated when I actually saw the details, though; the lore, the mechanics, the characters, the level design… I realized it was one of the most serious and ambitious efforts in its field, the kind of semi-old-school, story driven RPG that is immediately familiar despite the freshness of its world. And that’s for any indie company, much less a Greek one. T.Z. : My experience is similar. I didn’t know much beforehand, but I was informed about the game from both a productive perspective and a fan perspective, and I was inspired by both. I am a fan of the genre of story-based RPGs with turn-based combat, and the compilation of material I was presented with, including concept art, lore, and some demonstration of characters and levels, got me excited about the prospect of putting my touch on it. What exactly do you do for the game? A.R. : I am the sound engineer for the title, which means everything from creating the sound effects from raw sounds, populating the levels with realistically placed ambient noise, and so on. “Which sword clanging sound is more fitting here?” “Should this fiery explosion go ‘boom’ or more like ‘whoosh’?” “Should birds be audible from the Castle’s windows, or are they too high for trees outside?” Those are examples of questions that come up frequently and need responses quickly, but they give a good idea of where my work is evident in the game world. It’s a complicated process, requiring a lot of communication and it includes quite a bit of trial and error, but I believe the result is worth it. I do value attention to organization and planning during the development process, and the team is happy to oblige, so progress so far has been efficient. T.Z. : I am the composer, tasked with creating the game’s soundtrack, including fascinating, mood-setting ambient music, a compelling battle theme or three, including specific scores for bosses, and any peripheral music necessary, such as the one used in the opening. It’s an exciting venture, certainly, and it helps me realize my own vision of creating music as well, but it’s also demanding. I work closely with the sound engineer and the creative director to ensure every note suits the theme and circumstances of the story and the area it is presented in, but all in all, I am pleased with what has been achieved so far. A.R. : You mentioned the opening, and the wonderful narrative voice came to mind, and then I remembered that I didn’t mention the fact that I also oversee the studio process and the direction and editing of the voice acting. What gives you the inspiration for the game’s themes and sounds? What sets the mood? A.R. : There are lots of sources of auditory inspiration, either specific or giving an instigation to a different approach, but it all depends on the topic. For example, a good reference for environmental set up is the Diablo series, with its dark, gothic ambience befitting Jinx’s mood quite well. That very mood requires a particular “auditory perception” to grasp properly, and research is very useful in order to accumulate a breadth of acoustic variance within that scope. Games like Alan Wake and Dark Souls make good use of many sound techniques to relay their mood to the listener, for instance, and are prime research subjects for such topics. On the other hand, the narrative part of the audio needs to be handled differently, such as it is by games like Dragon Age or movies like The Mists of Avalon; an underscore that delivers the emotion and the atmosphere, without detracting from the communicated story. T.Z. : An established, overarching mood makes my job easier, especially if it seeps through more situational tones. It allows me to set up a specific motif and use it as a basis upon which to expand and build the emotion that each situation demands. Understanding this overarching mood, however, and reaching a decision about how to approach the composition, is trickier than many people realize. I sat down with the lore team and got practically bombarded with every imaginable tidbit of the game that seemed relevant: concept art, character designs and personalities, lore – including some spoilers – and, more importantly, expectations. I really believe that the Gothic feel of the world, combined with the mythical scope of the story, has all the ingredients for a truly epic score, and I am looking forward to delivering it. With a symphonic orchestra. With or without a chorus. I may be kidding, but you’ll notice that there will be a romantic tone underlying in the melody, blending a mythic sense of wonderment and an everpresent gloom, a mixture of sadness and hope and perhaps a tiny bit of bittersweet nostalgia, that I hope will make the older to relieve their forgotten childhoods and the younger to expand and inspire their imagination. Thank you both. Do you have any last comment? A.R. : Thank you as well. Getting involved in the creation process of the game only made me want to see the final outcome come to life that much sooner! T.Z. : Thank you. I cannot wait to play this game and see it from the gamer’s perspective. Visit our Youtube Channel for more tracks!